For gaming, using a large TV is both good and bad. Big TV screens are great for developing a strong sense of immersion, but when it comes to gaming features, they don’t have nearly the same level of performance as monitors. Televisions routinely have weaker response times, inferior refresh rates, and they rarely use dynamic sync features. This is especially true for bigger screens. 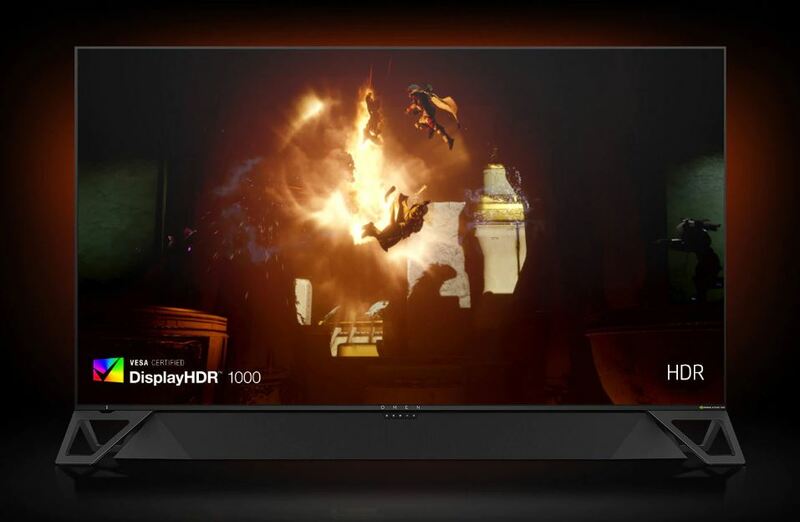 When people first look at the OMEN X, they usually think that they’re looking at a television. But this is actually a very large monitor. And the OMEN X is nothing short of futuristic. True to its name, it was made specifically for gaming. Consequently, it provides literally everything you would want from a top-shelf gaming panel. But unlike all other top shelf gaming monitors, the OMEN X brings those features to a hysterically large 65” screen size. The OMEN X wasn’t only made to look nice. It was constructed with a built-in SHIELD TV console, and you can use that console to play SHIELD TV games or Android games. But for most people, it’ll be used for streaming video services like Netflix. Because this console is supported by an 802.11ac Wi-Fi card capable of carrying 4K connections, all your smart-TV essentials are covered. The OMEN has a stunningly powerful visual presentation, in part due to 4K resolution, and in part due to HDR support. Overlapped with a slew of different gaming features, this is inarguably the best monitor of this type because it’s the only monitor of this type. It wouldn’t be unreasonable to call this among the best monitors in the world, though it’s certainly not the right screen for finding a high value to dollar ratio. 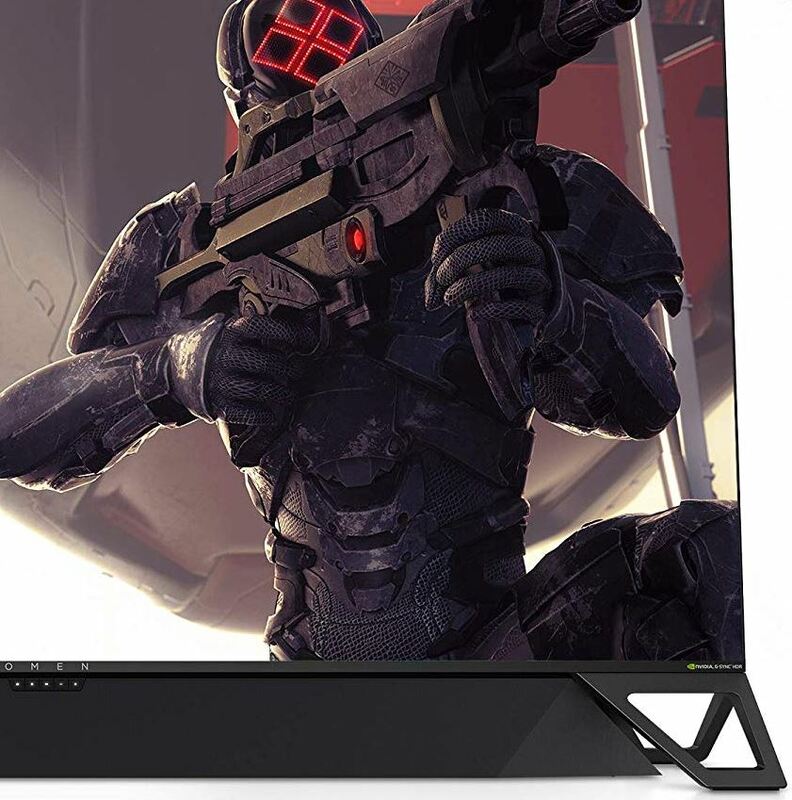 The OMEN X Emperium 4K Gaming Monitor measures 36.8 x 57.01 x 13.4-inches, and weighs roughly 80lbs. Nothing about the frame or the cabinet really telegraphs the gaming oriented nature of this monitor. Even the stand is pretty generic looking. For many people, it would be tough to tell this monitor apart from a high-end television. Once you’ve got it setup, you’ll notice a light glow occurring behind the OMEN X. It’s because the backside uses RGB lighting. Naturally, those lights are adjustable to any color. Though this lighting effect looks great in promotional photos, when you’ve got it against your wall, it’s actually very subtle. If you were expecting more than a faint glow, the subtly will probably be a minor disappointment. But it’s probably a good thing because it means the lights won’t be a distraction. Additionally, it might be worth noting that having LEDs on the backside makes everything back there a little easier to view. Studying the backside of the OMEN X Emperium 65, you’ll find three HDMI 2.0b ports, and one DisplayPort 1.4 input. The HDMI ports support HDMI ARC, so you can connect this display with computers, consoles, Blu-ray players, and so on. For audio support, you’ll find a standard line-out and S/PDIF out port. There are also a pair of USB 3.0 ports, though that’s hardly surprising. 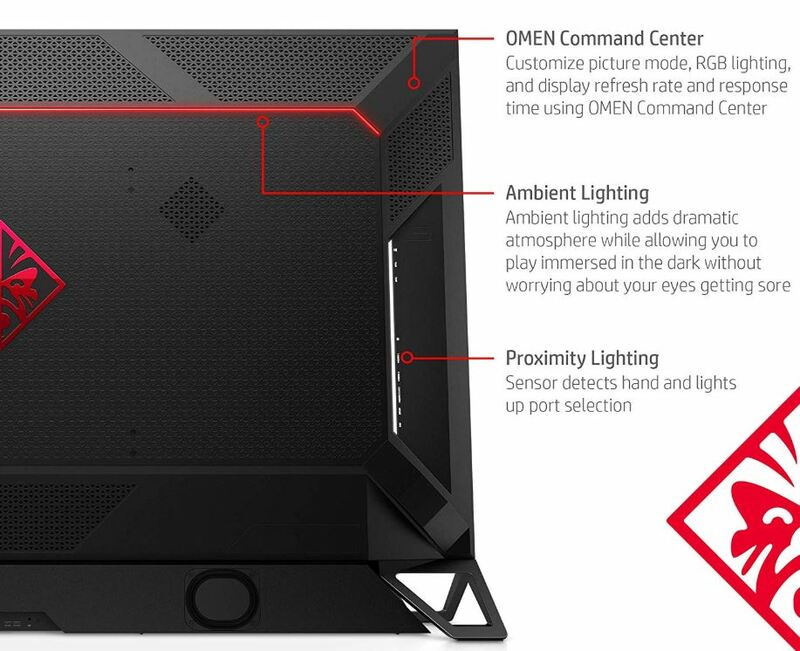 In addition to the illumination provided by the standard RGB lighting, the OMEN X actually has a couple of sensors designed to detect hands. When there’s motion on the backside of the monitor, as your hands approach the ports, extra lights are thrown on. Really quite helpful, it would be great to see features like that incorporated into all high-end panels in the future. Monitor audio tends to be terrible, and for pretty much the same reason built-in TV audio isn’t very good. You generally want your audio equipment to be independently constructed from your screen. Sometimes, monitor brands will try to get around this problem by not building speakers at all. The OMEN X went another direction entirely. HP included an Emperium Soundbar, made to be proportional to the size of the OMEN X. It’s supposed to rest along the front side of the panel, near the base. With respect to sound design, you’ll find this equipment, like the OMEN X, was made with gaming in mind. It’s rated for a 120W output, and can support as many as three stereo amps. Though there isn’t a subwoofer on board, HP does provide Low Frequency Array technology to take on bass tones. That’s pretty important given the critical relationship between bass, gaming, and immersive media. Moreover, there are actually two separate modes for the sound bar. One is made for general entertainment purposes, like streaming content from YouTube. The other is made specifically for gaming. The difference between them isn’t night and day, but the gaming mode prioritizes general clarity in the mid-tones while amplifying the bass tones. If you throw on the gaming mode and like it, then it’s possible you’ll never end up turning it off. The OMEN X is a 65” panel. Technically speaking, it’s a 64.5-inch display, though it’s standard industry practice to round up and call it 65”. Compared to large televisions, that’s really not that special these days. But compared to monitors, that’s enormous. It’s an 8-bit AMVA panel, which provides support for 3840×2160 resolution. That’s more commonly known as 4K. You probably wouldn’t want to go much larger without exceeding 4K resolution as well. Because the screen works out to be about 68 pixels per inch, which means it’s not ideal for work tasks. For the sake of comparison, 68-PPI inch resembles a 32” screen that’s running 1080p. Consequently, this panel was uniquely suited for gaming and entertainment, but wouldn’t serve as well as your everyday email reading display. If anything, this highlights the need for 8K resolution to be further developed. Someday monitors this large will be optimal for turning into a workspace display, but not with the OMEN X.
Oddly enough, HDR features are only now beginning to reach gaming monitors, so gamers don’t tend to think about them. But HDR content provides greater color vivacity, which contributes to an immersive media experience, in gaming or otherwise. The Omen X actually has the highest DisplayHDR certification, the 1000-certification, which is possible thanks to the help of 384-zone backlights. Brightness comes in at 750-1000 nits, depending if you’re using typical display resolution content or HDR content. In either case, that’s almost twice as bright as entry-level televisions or monitors. The typical contrast ratio is closer to 4000:1, but it can dip a couple hundred points, and reach as low as 3200:1 depending on the circumstances. Combined with quantum dot enhancement, the result is 95% DCI-P3 color spare reproduction. Because gamers really aren’t used to this kind of color vivacity, it can actually catch you off guard at first. But the visual performance of this screen is a combination of several features, including many which are specific to gaming. Response times tend to be a less important aspect of choosing a monitor, but they’re worth highlighting because it’s one of the more significant differences between monitors and televisions. Here, you’ll find more favorable comparisons. OMEN X delivers 4ms responses, which is pretty much the same performance you’d get from this monitor if it were 30” instead of 65”. That’s impressive in its own way, though it’s not something you’ll easily appreciate unless you’ve been using a standard TV for gaming prior to using the OMEN X.
It’s getting tougher to claim a monitor is made for gaming unless it can support higher refresh rates. The OMEN X provides a default refresh rate of 120Hz, which is about twice the speed of typical PC monitors. It can be overclocked to 144Hz, but you lose a small amount of color vivacity in the process. Though 144Hz isn’t the default, the difference between 120Hz and 144Hz is actually pretty miniscule in most circumstances. And then there’s dynamic sync. The OMEN X is a G-Sync monitor, but it’s not ordinary G-Sync. The technology used here is actually G-Sync Ultimate, which is basically a branded version of G-Sync HDR. That’s necessary for the G-Sync to be capable of accommodating the HDR-1000 rating of this panel. The inclusion of G-Sync means if you’re running at a lower framerate, your content will look beautiful. Support for 120Hz and 144Hz refresh rates mean if you’re running at higher frames, your content will look beautiful. It’s win-win. Using an AMVA panel means the OMEN X can provide 178° viewing angles. Normally viewing angles aren’t something to obsess about, but when you’re dealing with a large screen that’s probably going to be viewed from several angles, it matters a bit more. It’s possible to VESA mount this display. But it does weigh about 80lbs, which can make it troubling to find the right equipment for holding it. Though this isn’t exactly a standard monitor, HP does include their standard display warranty. Who Should Choose the OMEN X Emperium 65 inch 4K Gaming Monitor? It’s easy to fall in love with this monitor. Between G-Sync, 4K, HDR, and boosted refresh rates, this display feels close to perfection. For people attracted to smart-TV features, built-in NVidia shield is hard to overlook. Having wireless built right into the screen means you don’t need to run Ethernet cables, either. The Quantum Dot tech is just a cherry on top. Unfortunately, it’s also easy to see the downside of the OMEN X. It’s ridiculously expensive. With respect to gaming and entertainment, this monitor provides everything except the kitchen sink. Though its pixel per inch count is not ideal for using this monitor for everyday tasks like reading news websites, you’ll have to wait for an 8K monitor to solve that problem. Perhaps in the distant future, when the Earth is ruled by robotic koalas, we’ll be able to get these kinds of features on large screens at lower prices. 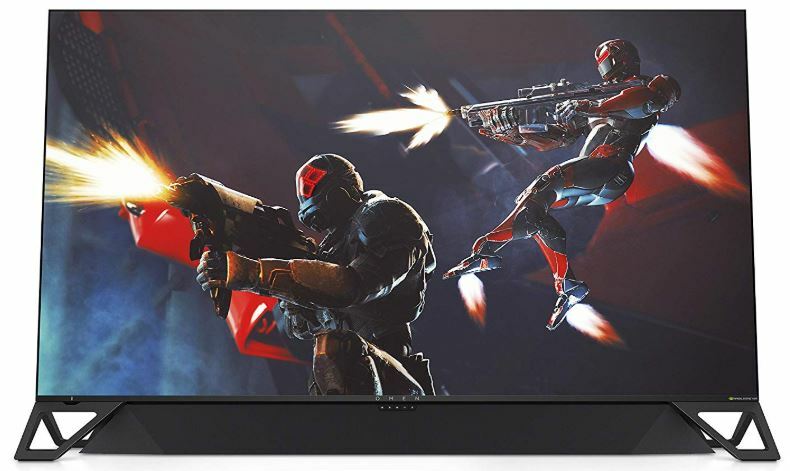 Until that day, the OMEN X by HP Emperium 65 inch 4K Gaming Monitor is a good choice for any gaming fanatic who wants the unique combination of features this display can offer.